Round 1: Work 6 s c in second st from hook. Round 2: 2 sc in each st — 6 sts increased. Round 3: * 1 s c in each of next 2 sts, 2 s c in next st, repeat from * 5 times more — 6 sts increased. Round 4: * 2 s c in next st, 1 s c in each of next 2 sts, repeat from *5 times more — 6 sts increased. Round 5: * 1 s c in each of next 3 sts, 2 s c in next st, repeat from * 5 times more — 6 sts increased. Continue in this manner to inc 6 sts in each round, being sure that increases do not come directly over each other, 7 times more 72 s c.
Work 3 rounds even in s c.
On the next round dec 4 sts and repeat this dec EVERY ROUND 4 times more, being sure that decreases do not come directly over each other — 52 sts. Work 1 round even in s c. Fasten off. FINISHING: Use wrong side of s c for right side of hat. 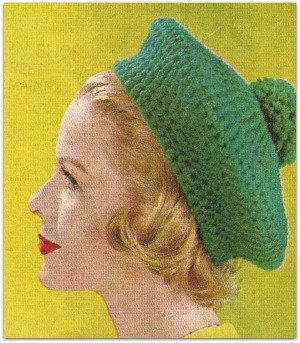 Make a pompon and sew to centre top of hat. 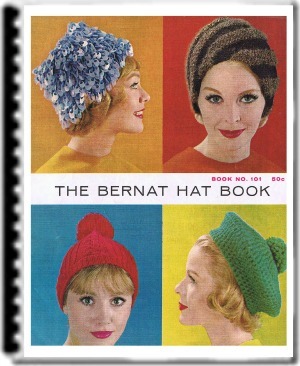 "The Bernat Hat Book 101"